Onyx 236 (team mate to Hill Onyx 235 also listed)1995 Rothmans Williams Renault FW 17 David Coulthard #6. Combine this one with Onyx 235! 1990 LEMANS HYDRO ALUMINIUM PORSCHE 962 C IN BOX. Very aerodynamic, wind-cheating design was the hallmark of the 2000 LeMans race car that finished 3rd. See condition information for this model above. What did Brown do for Porsche back in 1998. See condition information above. Onyx 1/43 scale Diecast model McLaren F1 car NEW -#11 Alain Prost MINT condition. Shipped with USPS Priority Mail.Sat in the closest was just taken out for these pictures! 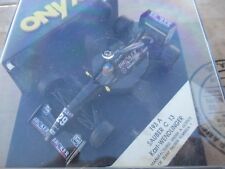 No known defects on the car!Formula 1 Champion A.Prost #11 on this model! Has real rubber tires and colors are White,Red and Black! Comes in Original box! Look at pictures for best description! No damage with car or decals on it! Great for collectors! Thanks for looking! A not often seen replica of an Indy Car driven by Al Unser Sr. to a 13th place finish in the 1990 INDY 500. The car and base are in very good condition. The clear cover is fair. See pictures. If you have any issues let us know we are reasonable. Ken Schrader Kodiak. 2020 Chevy Lumina. In the original box and plastic case and well kept. CHECK OUT OTHER MODEL LIKE, FORMULA 1, INDY CARS, NASCAR, MX MODEL BIKES, MOTOGP, NHRA TOP FUEL FUNNY CAR MODELS / DRAGSTER'S, ETC. Hill wouldn't know it going into 2014 withAyrton Senna as his team mate but it would be a rough year. Damon simply kept the #0 for 1994. #5 Williams Renault FW14. 1991 Formula One Collection ( F1 '91 ). ONYX 1/43 scale -. Like new with a minor flaw on decal as shown, and a price sticker on box. Produced by ONYX. Original Box. Never on display or out of box. 1999 24 HOURS LE MANS TOYOTA GT ONE #2 VENTURE SAFENET TEAM 1/43 SCALE DIECAST REPLICA MODEL CAR. LE MANS COLLECTION. MODEL IS IN NEW CONDITION / PLASTIC CASE HAS MINOR SHELF WEAR, BUT IS OK FOR DISPLAYING SHOWCASE. ONLY ONE FOR SALE. THE 1999 TOYOTA GT ONE LE MANS FEATURED A RV36V 3.6L TWIN TURBO V-8 ENGINE. 600 HP / 6000 RPM'S / 6 SPEED TRANSMISSION. APPROX. Great shape. Rothmans decals, Rare. 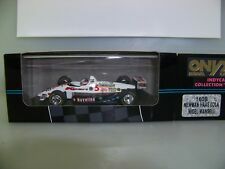 This Is A Onyx Model Indy Cars '90 Collection Penske Kevin Cogan 1:43 Scale Diecast. #1 Chevy Lola - Texaco Havoline - Energizer - Gilette - Corning - KMart. 1994 Indy Car. ONYX 1/43 scale -. ORIGINAL VEHICLES in ORIGINAL BOX. We are in the NW Phoenix area. 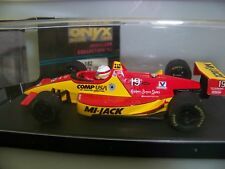 Indy '90 ONYX #51 red box ( I have a blue box version-Formula 1).